I always hated the inverted pyramid, that news technique of speed and convenience meant to give the audience a jumping off point once they reached peak information in a story. It felt cheap and like giving up on the power of telling story. My career in journalism happened at an unfortunate time in history. A time when the once captive audience of print discovered the Internet and the entirety of human knowledge available at their fingertips for the price of a little portable, wireless technology. I realized this early on when I wrote a controversial story about scarification for my hometown newspaper in Salem, Oregon. Whereas my editors saw some gritty news about unregulated tattoo and scarification artists essentially performing surgery on people, I saw an interesting cultural discussion about body modification and self expression in young people. That story was supposed to run buried in the entertainment section. But someone made a mistake, and it ran A1, complete with a photo of someone’s calf with wide strips of skin cut out with a scalpel to create an artistic scar. We had twenty cancellation calls by the time I got to work the day the story ran and no shortage of complaints pouring in from our octogenarian readership. I had written a story that my non-newspaper reading friends would enjoy discussing, because I was tired of doing something every day that wasn’t relevant to my own generation. It nearly got me fired. I was saved by the fact that someone else’s error caused the story to run on the front page and not my own manipulation of the editorial process, as the executive editor must have surmised. Still, that moment defined my career in many ways. I have always looked for ways to tell stories in new ways, to drive the news through new channels to reach eyes and ears dulled by the drone of ordinary. Recently, the comedian John Oliver was lauded for the awareness he brought to the net neutrality issue after running a particularly scathing piece of satire on his new HBO show. Many thousands of people commented on the FCC’s site to the point that the traffic shut down the site’s servers. No television, newspaper or radio story could’ve done that. Not in a country so inundated with news that the average person is far more aware of local, national and international stories by 8 a.m. from having perused Twitter or Facebook in place of the morning paper. My favorite editors like to say that people are more aware, yes, but lacking context and analysis. And those editors are right, which is why I have stayed in the news business so far. Watching John Oliver convince a massive television and Internet audience into political action got me thinking about how news filtering through certain channels is more effective than 30 inches of copy on 48-inch broadsheets made of wood pulp, the former standard-bearer for anything of importance. It’s no secret that Americans are less concerned about climate change than other countries. In fact, it’s difficult to talk about climate change in any constructive way today. In some ways, Americans, like the rest of the world, are too inundated by rhetoric that takes over and looks like news, so they shut everything else out and stick to their guns, figuratively speaking of course. When an opportunity came up to look at the future of the Great Lakes, the largest source of fresh water on earth, through the lens of Climate Change, we were presented with a golden opportunity. An opportunity to avoid shoveling more climate change down the throats of Americans who have already tasted quite enough. We decided to fictionalize the news in order to make it more palatable. But before you stone me for ethical failure in journalism, hear me out. We enlisted a group of writers we knew to be great flash fiction specialists. Meaning they write short, tightly woven narratives around difficult topics. We had them speak with scientists, water specialists and planning council members about what major issues might impact the Great Lakes in the future. Then we had them build these scenarios into dystopian stories set in or around the Great Lakes more than 100 years from now. These short stories are built on scientific possibilities, and they’re designed to get people to think about the future and the ramifications, both good and bad, of our current actions or inactions. We are not seers, psychics, prophets or clairvoyants, so we’re not trying to say the future will be a certain way. But we want the public to think about what it could be, as they make decisions about what they talk about with others, the things they read and the television they watch. 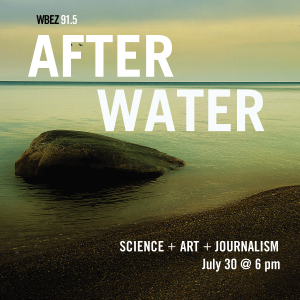 This is another way to present the news, this time through the lens of dystopian fiction from writers who interacted with scientists and experts from around the Great Lakes. Whether you are firmly on one side or other of the climate change debate, I challenge you to listen to these stories and consider what you think the future might look like for those who come after you. Previous PostWhy you shouldn’t Google yourselfNext PostWhatever happened to the great American family road trip?